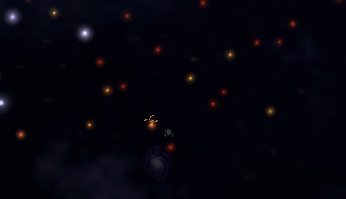 This Spore post is about the Centre of the Galaxy. 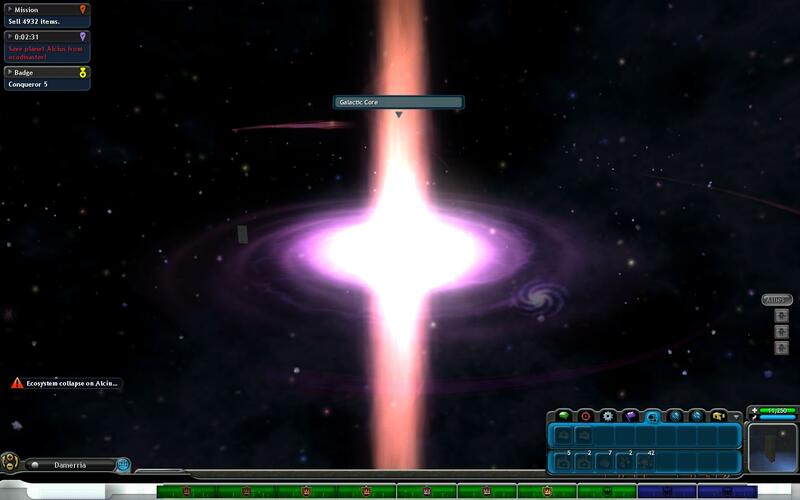 It’s a giant purple black hole in, not surprisingly, the middle of the Spore galaxy. This also happens to be Grox territory. Getting there is a pain in the neck, because you have to travel a vast distance (even with the use of a wormhole key) and your travel range gets seriously stunted for some reason. You’ll also most likely have a ton of Grox spaceships shooting at you. Be prepared to lose your fleet, and stock up on energy and health packs before you leave. You’ll get a new tool called the ‘Staff of Life’. It only has 42 uses, but it instantly terraforms a planet to T3. Steve also mentions that you should stop by “the third rock from Sol” for a free breakfast or something, but no changes happen on Earth so this is probably just a hint about the Sol system. After your meeting with Steve, you’re plonked back outside the galactic core. My advice would be to go to the nearest Grox planet and wait until you die so you’ll be teleported back to the nearest colony. If you’re after making a trail of colonies along the way though, this won’t get you far and you’ll have to attempt the journey back. The Return Ticket super power will come in handy here, if you have it. Nothing really changes after this adventure, other than an entry on your timeline stating you’ve reached enlightenment. Once your Staff of Life runs out, you can’t go back to the centre to recharge it – 42 uses is all you get. That’s about all there is to it. 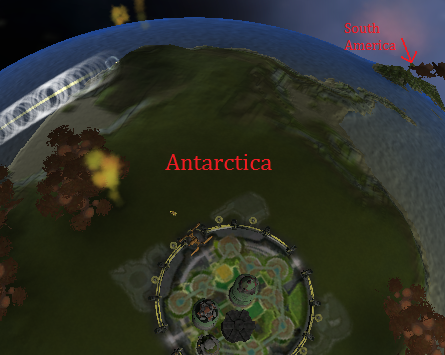 You might wanna read my post about Earth on Spore if you haven’t already. 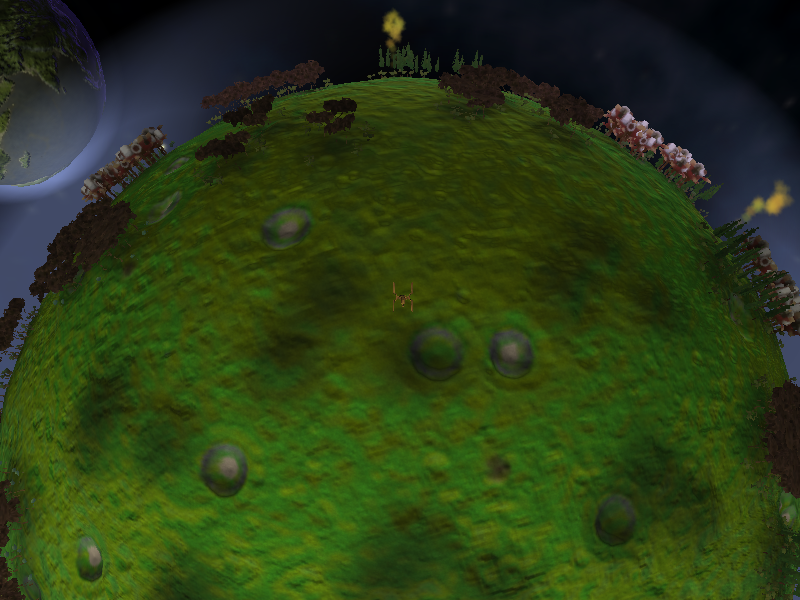 As some of you will know, Earth – and in fact the rest of the Solar System – is present in Spore as an easter egg. I’m not going to provide you with the details on how to get there, as there are plenty of instructions and videos already. The star (our Sun) is named Sol, which is the Latin word for sun. The planets Mercury, Venus, Earth and Mars are included, and can be terraformed and colonised with like any other planet in the game. The Moon, Titan and Ganymede are also there. No other moons are, however, as there are too many of them. Jupiter, Saturn, Uranus and Neptune, being gas giants, cannot be interacted with and are simply there for show. Pluto is not included, probably because of its title as a dwarf planet. Nothing much there. It has a big crater on it, but otherwise is just a dry, hot planet when you get there. Unlike its real life counterpart, which has a very thick atmosphere, the Spore Venus is simply a hot planet with a high atmosphere level since the designers couldn’t make it into a gas giant type planet. It actually has water on its surface at first, which in real life would be impossible with its current conditions due to the extreme global warming caused by its atmosphere. Other than these unrealistic features, there’s not much else on it. When you find Earth, you get the “Manifest Destiny” achievement. If you destroy it with a Planet Buster, you get the “Oh The Humanity!” achievement. Those factors themselves make it a pretty important planet. It has all the continents, and a few geographic landmarks (but not many). However, it is only T1, and often doesn’t even have a completed biosphere (in my game it was missing a herbivore and a carnivore). Terraforming it to T3 gives it an ugly pinkish-brown colour, so you should probably leave it as it is. Since the planet had to be scaled down, placing a colony often screws up the map. I placed my colony on Antarctica. I kinda messed up the coasts, but other than that everything remained unaffected. Besides, no one really cares about Antarctica… You can also safely place one over Russia. The Moon has a few craters and a very flat landscape (which can cause a bit of flooding during terraforming). If you use a Planet Buster on Earth and don’t intend to revert to a previous save after you get the achievement, then be prepared to lose The Moon as well, since it gets destroyed along with it. Ganymede is the only moon that orbits Jupiter which appears in Spore. Not much else to say. Titan is the only moon orbiting Saturn in Spore. Again, not a lot here other than the weird purple terrain colour. 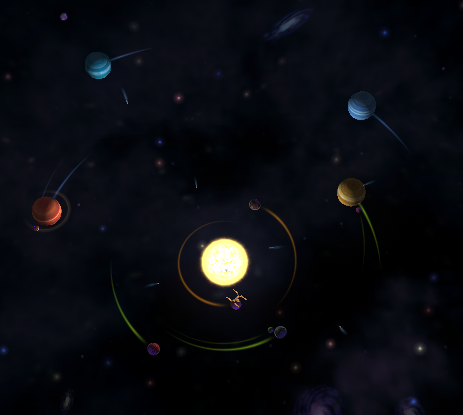 My next Spore post (whenever I get around to writing it) will be about the Galactic Centre. I’ll update this post with the details tomorrow. Title says it all. It had been in a star cluster only a bit away from my Home Planet. No wonder I couldn’t find it. 😕 I’ll try to get some good pictures, but my Spore screenshots always come out crappy so don’t expect much. Finished! Two weeks late, though… Click here to go read it. Terraforming is changing a planet using ship tools. You can sculpt the geography of a planet, change its colour, and can even make a barren wasteland into a thriving centre of life (wow that sounded dorky). Most terraforming tools are always available once you buy them, and they use up the ship’s energy. Some however are one-use, and you need to buy more of them when you run out. Sorry about the pixeliness. Apparently MS Paint isn’t the best at image resizing. The little red thing (surrounded by a green circle) is the TerraScore. The funny looking thing in the middle is where you need to get that red dot to. For the planet above you’d need to make it hotter, because of the dot being closer to the left side of the meter, which is where the blue thermometer is. If you want a perfect T3 planet, you’d also need to decrease the atmospheric levels, because the dot is over the halfway line, so its nearer the white cloud at the top (which means its atmosphere is too dense). There are lots of tools that let you change the planet’s climate, but I’ll cover them in more detail in a later post. Or just put them on another list. I dunno. After you make a planet T1 (the outer ring of that target above) you need to stabilise it by placing plants on the surface. You need to place one small plant, one big plant and one tree. Now your planet will stay T1 as long as you don’t interfere (it might wobble around for a while, but unless you went overboard with the terraforming tools it’ll be fine). but to complete the ecosystem, and make it livable for your species, you need to place some creatures. Two different herbivores need to be placed (GENTLY) onto the planet first. Then you need one carnivore or omnivore. Congratulations, you’ve just terraformed. On a T0 planet you can only place one colony, and can’t build any buildings other than the city hall. The city needs a protective force field to stop it being destroyed by the natural disasters that happen every few seconds. (Also, watch out for them yourself. Just because you got yourself a fancy space ship doesn’t make you immune to fire blasts, meteor showers and electric clouds.) Once a planet becomes T1 however, the force fields come down and you can build up to five buildings/turrets. Now your colony can get to work mining that spice that was floating off into space. As you increase the terrascore to T2 (by using more ship tools and placing another set of plants and creatures) you will be allowed to create more buildings, and can now place a second colony on the planet! Once you hit T3, you can buy as many buildings as you can fit into the cities, and get to place a third and final colony. Three colonies is the most a planet can support (unless you capture/buy another species home planet, in which case you can have up to 10). I’ll talk more about colonies in another post (cuz I don’t feel like doing it now). Changing a planet’s climate isn’t the only way to terraform. 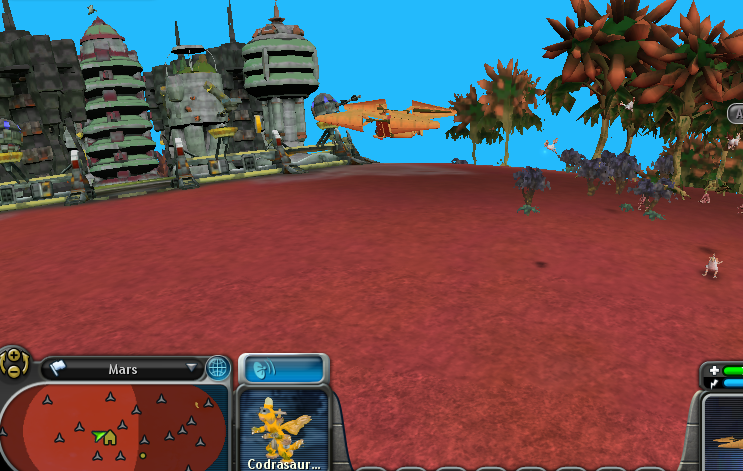 You can also use special tools (most of which you get the same way as rares, see my last Spore post) to sculpt the landscape and colour the planet in. You can get three free planet colouring tools by doing on of the Home Planet tutorial missions, and you can buy a few of the planet sculpting tools in the trade menu for some races (but you need to unlock them first). Using these tools is considered an attack if you use it on other empire’s planets. How would you like it if someone came along and turned your planet pink and made swirl-shaped oceans everywhere? If you accidentally change a planet’s colour but decide you don’t like it, one tool allows you to revert a planet to its original colours. However, you need to find it first. Sculpting tools cannot be reverted though (unless you do it yourself, which might be hard) so be careful where you point those things! Thanks for reading. Sorry I don’t have a cool picture to post at the end. My ‘Back to School’ post. Self explanatory. Woof’s…. review. Click it at your own risk. An out-of-date DragCave post. All dragons have grown up or been frozen, so there’s no need to click anymore. My 5th Spore post, about the tutorial missions. HAI GUIZ LETS GO BILT A SPAEC CHIP!!!! Ok, since Space Stage is so big, I’m gonna split it up into different subjects with one post each. The first post (which also happens to be the one you’re reading) will cover the “start” of this stage, as well as information on your Home Planet. After coming out of the Civilisation Stage, you get to design your space ship, which will be your new avatar. You can change it later, and it doesn’t really matter what you put on it (which allows you to be more creative than with your Civ Stage vehicles) so don’t stress too much over it. Your first task is to talk to the Command Centre. They’ll tell you to fly into big glowing balls that are hovering over the cities so you can learn how to control the ship. There’s no time limit, so if you want to look around the planet first go ahead. Afterwards they need you to locate a specific animal species on the planet and scan it with a new tool called – you guessed it – ‘Scan’. The Command Centre find this new animal fascinating, and want you to abduct one and place it inside one of the cities so the scientists can study it further. After doing so, they are alarmed to find out that the species have a dangerous new virus and the infected need to be eliminated. Use your new and probably only weapon, ‘Mini Laser’, and your ship’s Radar system to track down the diseased creatures and blast em. They’re normally easy to single out (unless they’re under trees, which makes it harder to see them) because they’re glowing yellow. After you kill five of them you’ll get a transmission from the Command Centre, congratulating you on a job well done. They’ve decided that you’re the “right stuff” and give you the rank of Captain. Accept your Captain’s Badge and buy an Interplanetary Drive, which will allow you to leave your planet’s atmosphere and travel around your solar system. Your new task is to visit a neighbouring planet which has been sending out strange transmissions. You need to investigate. When you arrive on the planet your radar will pick up the source of the transmissions. On further investigation the object in question appears to be the wreckage of another space ship. Upon scanning it, you will activate a transfer beam. The thoughtful aliens left you some Mini Proton Missiles and an interstellar Drive 1. With this new technology you can follow the coordinates programmed into the Drive and leave your solar system, perhaps leading you to the aliens themselves. When you arrive on the planet you will discover that the civilisation was destroyed. After scanning a nearby city you will recieve an incoming transmission from their defence system, which was reactivated when you scanned it. After a few warning messages saying that they were gonna kill you, thinking you are something called “The Grox” , their defence droids pop out from behind a hill and try to blow you to pieces. Using either your Mini Laser or the new bombs you got, destroy the bots and return to your Home Planet to report. Since even the tutorial for Space Stage is so long, I’m gonna make the rest of the “starter missions” into a list. Yay. Colonisation: You have to establish a colony on a barren hunk of rock to expand your empire. Make sure you’re on the planet with the green trail, because else it will be pretty hard to do a later mission. Aliens: You have to find an alien empire and have a chat with them. To find one hover your mouse over near-by stars and see if they emit a blue pulse and make strange noises. Spice Sale: You have to sell some spice to an alien empire. However, if they don’t like you, you can’t trade with them, so try to find some friendly ones. If you can’t be bothered looking for the best deal, just sell one bit of spice and keep the rest for later. As long as you sell some spice, no matter how much, the mission is complete. Those missions all come in that order. After Spice Sale however, you get a list of missions to do. You don’t have to do all of them, and there’s no specific order, but some aren’t available at the start, so you need to do the missions before to unlock it. Rares: You have to find an artifact and bring it back to your Home Planet. You can find these rares by visiting different solar systems and looking for a yellow pulse coming from a planet. Go down onto the planet and use your radar to find the object. However, sometimes it’s not a rare at all. You can also find planet colouring and sculpting tools (I’ll come to that later). Also, the planet’s residents don’t like it when you steal their stuff. And watch out for pirates! Planet Colouring: You are given three planet colouring tools (red skies, blue water and purple ground). Just go to any planet and colour it in. Preferably not someone else’s planet, because not everyone appreciates your art. The planet with the destroyed cities you just visited would do nicely. Terraforming: You need to transform that barren moon you colonised into a fairly-alright place to live. Your tools? Some plants, some animals, and a smoke machine. Just plonk the smoke machine onto the planet, wait till you get a message saying it’s T-1, and put down the plants and animals. You need a small plant, a big plant and a tree. Then put down two different herbivores and a carnivore/omnivore. Be gentle though! Keep holding the mouse until the creature is safely on the ground. Before you go, you might wanna put some buildings and turrets in the colony too. Artifact Sale: You need to sell a rare to another empire. If you lost the rare you found previously, then you need to go find another one. Trade Route: You need to establish a trade route with another empire. If that empire has a blue or green smiley face, then go into ‘Diplomacy’ when you’re talking to them and select the trade route option. After a while you can even buy their whole solar system! Just like Civilisation. Allies: You need to make an alliance with an alien race. Complete missions for them or give them gifts (a.k.a. bribe money) to get them up to green smiley level, and propose an alliance the same way you did the trade route. War: This one can be pretty tricky without better weapons, so you might wanna wait a while. You need to capture a planet for this mission. Or at least destroy all of the cities there, if you want to do it that way. If all the near-by empires are already friendly with you, then your Home Planet won’t send you to go to war with them. Just make them angry with you to solve the problem. Yellow to orange smiley is recommended. Red means they’ll probably start a war with you, and you won’t get your mission reward. After you destroy or conquer all colonies on the planet, return to your Home Planet, get your spucks, and prepare for galactic war. Those are all the missions you can get from your Home Planet. after that it just becomes another colony. The only difference is that you can get repaired and recharged for free here, which is helpful at the beginning of the stage. It also has lots of cities, which are still in Civilisation style (they still have the old-fashioned turrets, for example). However, you can capture another empire’s Home Planet too, which has just as many cities, and is much more productive. Your Home Planet is rubbish at mining spice. It still does it at Civ Stage rate, which is pretty slow. And if you really want Civilisation Stage type cities, you can go advance a Civ Stage Planet and then take it from them when they make it to Space Stage. To do that you need to use a monolith, but that’s for another post. Also, don’t forget to read Jamie’s DSi Brower review and FlipNote Studio review, and Guinea’s review too. Meat – Kill a creature and have one of your villagers collect the meat. The amount of meat depends on the size of the creature. If you kill an epic you’ll have food for days, while if you kill a pest you get barely enough to fill the plate. Fruit – You can pick this off bushes, same as in creature stage. Eggs – You can steal these out of creature’s nests, or if you tame a creature you can harvest them from a box in it’s pen. Fish – Certain areas of water have lots of fish. You can tell your villagers to go fishing there. If you over-fish an area, you’ll have to find somewhere else. Fishing spots are displayed on your mini map. Seaweed – Only herbivores eat this. They catch it instead of fish. It’s treated the same as fish, so if you pick too much of it the fish (and the seaweed) goes away, and you’ll have to find a new spot. There are lots of thing you can do with food. You can “buy” new tribal members with it, build huts for housing tools (more on those later) and bribe other tribes into liking you. Nothing says ‘Howdy, neighbor!’ like a big basket of seaweed! 2. Make them your ally. If you like making friends better than ripping heads off unsuspecting cave-creatures, then you need to appeal to the tribe in question’s tastes. The most forward way of making friends is to play music for them. All tribes have one type of instrument at the start, and you unlock more along the path to transcendence. But as I said above, you have to do what that tribe likes. Members of the tribe will yell out which instrument they want your band to play in the form of little emoticons. Oblige to their requests and your little friend meter will soar upwards. At the end of the performance the other tribe gives you a rating out of ten, and your relationship improves accordingly. Just like in creature stage, you need a big green smiley face to become allies, after which your new friends will share with you the secret to their unique tools. You can also give them gifts (a basket of food) to temporarily improve relations with that tribe. Gifts are a good idea when the tribe hates you and would likely attack your band on sight unless they were soften with bribes first. When you become allies with a tribe they will often send you gifts – but make sure someone is there to pick it up, because sometimes if no one takes the gift they take it back with them! For those with more morbid tastes, you can take the bull by the horns and launch an all-out attack on the tribes village. Apparently that doesn’t sit too well with the locals, so be prepared for resistance. All tribes have a type of weapon readily available to them from the start, so if you have the food to spare you might as well equip your little soldiers with it – after all, anything’s better than your fists (unless you have maxed-out fighting abilities from creature stage, and even then it’d be a close battle). Also, if you have poison spit launchers, they can be pretty handy. All weapons have a super attack, which all selected tribe members with that weapon will use. Spears have a charge attack, but instead of stopping when they hit their target, they will continue running for a while, possibly injuring multiple targets. Flaming torches are used to stun the target for a few seconds. Stone axes are swung around in a circle, dealing large amount of damage to the opponent(s). When attacking a village, don’t bother destroying the smaller tool shacks. Aim for the Main Hut. When the Main Hut is destroyed, the tribe falls into disarray, and ultimately dies off. Killing all the tribal members makes your job easier, because you can lose a fair amount of your own contingent if you let them pick you off while you’re working on the Hut. Note that the same thing can happen to you, so if you make an enemy, defeat them as fast as you can, or at least bribe them long enough for you to get your forces up. When the Main Hut falls, the spoils of war are yours – their tools and (if you feel like it) their food supply. The tools are added automatically, but you need to get your tribal members to pick up the food and bring it back to your village. It might take a long time, especially if there’s a lot of distance between the two villages. Enemy villages seem to have the same idea, but normally they’re not bright enough to register that the village’s occupants are standing there looking at the them. If you can take them down fast, you can take your bundle of food back from the would-be thief and plonk it back on the pile. Don’t bother giving chase if you didn’t catch him though. It’s not a big loss. Throwing Spear – The tribal version of Spit. Good for long distance attacks. Stone Axe – The best weapon for close-combat with enemy tribal members and creatures. Flaming Torch – Not a great melee weapon, but very effective against huts. Wooden Horn – An instrument. Healing Rods – Heals creatures that are on the field – it’s a good idea to have one or two of them when you go into battle. Fishing Spear – Helps catch fish faster. Gathering Canes – Allows your tribal member to carry more food. Useful for looting a defeated tribe’s food supply, or taking meat off a dead epic. Tools are very useful, but to access tools you need to build the specific hut. And to unlock most tools you need to conquer or befriend tribes who do have access to them. All together there are nine different tools, but there’s only enough room for 6 huts, so chose them wisely. Even though your creature has evolved, don’t forget about the other ones. There are plenty of creatures out in the wild. If you have the food, you can domesticate a species and farm them for eggs. Lots of eggs. You can have up to three different species (one of each) in your tribe’s animal enclosure. If a raiding party attacks your hut, your pets will try to attack them. They will fight to the death, which might not be very long, but at least it distracts your attackers long enough for you to prepare for battle. If you had any ally creatures with you at the end of creature stage, they will automatically be domesticated, which can save you time at the start of the stage. For some reason they’re always much smaller than other creatures in tribal stage, even rogue ones. Also watch out for UFOs. Normally just a minor annoyance, they abduct your domesticated animals and occasionally your villagers themselves. If your unlucky enough to have your chieftain abducted… your screwed. Normally your chieftain just respawns after a while, but not when the aliens get him. You’ll lose the use of your tribal stage super powers, you won’t be able to conduct bands and you’ll lose the ability to select all your tribal members with the click of a button. Now you know how enemy tribes feel when you kill their chieftain. Another minor annoyance are pests. When there’s no adult tribe member in the village a pest will scuttle in and steal your food. It won’t stop eating till you get back. It’s not a big deal when you’re loaded with food, but at the start it’s a fairly big problem. Also, if you leave any babies unattended they get attacked and normally killed if someone doesn’t come to the rescue. There are also epics in tribal stage. They’re fairly easy to kill, but it might be wiser to let them live unless you have a shortage of food or they’re attacking your village. Because occasionally epics destroy (or at least weaken) other tribes, helping you on your way to the top. Based on your decisions in your creature’s past, you have a number of super powers at your disposal. Herbivore: Refreshing Storm – Causes plants to grow more fruit (even if already picked) and drop it to the ground. Omnivore: Flying Fish – Causes our old buddy the Sea Serpent to rise from the depths and scare all the fish out of the water – easy pickin’. Carnivore: Traps – Lays out a big bowl of food for all the hungry woodland creatures. They all hop over, thinking this is their lucky day… and drop dead, the poison gas turning their brains to mush (but not effecting the rest of the meat 😛 ). Social: Fireworks – Fireworks are very popular with rival tribes. It can increase relationships with neighbor tribes, and will stop raid parties in their tracks. A free and effective alternative to gifts. Adaptable: Beastmaster – Momentarily adds creatures to your tribe. They will help you socialize or fight until the effect wares off. Predator: Fire Bombs – Your chieftain spews out mini bombs in a circle around himself. Good for melee fighting, as it doesn’t damage your own tribal members or huts. Every time you destroy or unite a tribe, you get a tribal totem piece (and sometimes improvements to your village). The totem pieces differ depending on the way you acquired them. When you get all the pieces it’s time to pack up your supplies and head to the next stage – Civilization. Whew. Glad that’s done. And I got it finished earlier than I had hoped, too. If you call three whole months with no posts ‘early’. Don’t forget to read Spore Post #1 and my overall review on Spore if you haven’t already. When you crawl out of the sea, a freakish cross between a micro-organism and a thing with legs, your species will built a nest. And the first thought that will pass through your tiny little brain is….. food. If you’re a herbivore, just toddle over to the nearest fruit bush. The tall ones are no good since you don’t have any arms, so even if you’re tall enough, you can’t grab the fruit use rocks or sticks to knock fruit out of them. If you’re a carnivore, there’s a dead creature near your new nest. It’s normally a fairly evolved one, so it will last for a while. Don’t eat it all in one go, unless you need it. If you’re smart and you became an omnivore, you can pick either two (I personally enjoy the rotting carcass). Now that you’ve either got a full stomach, or have puked your guts up by eating the wrong food, you get a few more goals. One is to get a new part. The other is to meet a new species. To get a new part, you can break open one of the piles of bones surrounding your nest. The other way is to befriend or to kill another species. If you choose the latter, the second goal will be completed while working on this one. If not, use your map to locate another nest and simply click on a different species to complete it. To befriend a species, click the green ‘friendly’ icon at the bottom of the screen. At the start you will only have a level 1 singing action. As listed in my review, there are four actions altogether, each ranging from level 1 right up to level 5. Sing: Your animal will “sing” and, depending on its vocal skills, may perform a mini opera for the other species. Dance: You will perform a different dance depending on your dance skills. Charm: Unlocked at the start if you add an Electric sack to your creature. You will make dinging noises and yellow sparks appear around you. If you have higher charm levels, you may even perform a little dance. Pose: You put out your hands (and feet, if your skill is high enough) and confetti flowers burst out of them. The higher your skill is, the more flowers appear, and the louder the sound that comes with them is (a kind of trumpet ‘tadaaaaaaa’). By using these skills to copy the other creature’s actions, their disposition meter goes up. If you both reach the top (or in some cases you go flying past it) they like you. If not, you’ll have to try again. When you get enough creatures to like you, the species becomes your ally. There are three ranks in a typical nest. Regular creature, baby creatures and alpha creatures. They each have a different order of actions (if they have more than one to chose from). The baby is the easiest, a alpha the hardest. However, by befriending the alpha, you get a new part. The more evolved the creature, the higher value the part is. (Same with bone piles – the larger the pile, the more valuable the part is.) When you become allies with a creature (and when your brain gets big enough) you get add them to your pack. They’ll follow you around and help you hunt or socialise with other creatures. Note that some species hate each other, your follower will attack no matter what. This can completely ruin relationships with the other species. You can also heal at your allies nests. Bite: Does exactly what it says on the tin. Spit: The heat seekers of nature. You launch a number of purple poison balls at the target. The higher your skill, the more balls there are and the more damage they do. This can be unlocked by adding a poison sack to your new creature at the start of creature stage. Strike: You slash at your target with your claws, causing a lot of damage. My personal favourite. Charge: If you’re far enough away, you run at the target, paralysing it for a moment. The higher your skill, the longer they remain stunned. You can get this attack at the start by giving your new creature a spike. Again, if you kill the alpha you get a new body part. However, babies usually aren’t easy targets. They run away, and unless you have spit it’s very hard to catch up to attack. And adult creatures defend their young, so you’ll probably end up fighting them either way. One the species becomes extinct, the remaining ones float up into the air and disappear. If you’re lucky, there will be an egg at their nest. This will give you lots of extra DNA points if you eat it. You are also free to heal at the abandoned nest. Now that you’ve eaten, gotten some DNA points, and maybe a new body part or two, it’s time to get rid of that geeky cell look. Head back to your home nest and find yourself a mate. Use your mating call and click on the creature who responds. You will then lay an egg and be brought into the Creature Editor. In the Creature Editor, you get to add, remove and modify your creature. You can add some cool feet to your legs, make yourself a bit taller, add some arms, maybe some wings, and of course remove your stupid cell stage mouth. All the new parts you’ve unlocked from bone piles and alpha creatures will be highlighted with yellow stars. These might be new legs, some body parts that increase your level in a certain skill, or even something as pointless as new eyes. Eyes in creature stage are a ripoff. Keep your old cell eyes, unless you wanna waste 5 of your hard-earned DNA points. The only point in new eyes is for look, which isn’t very important. You are also able to change your skin pattern and colours. All six extra skills for socialising and fighting can be unlocked without extra parts. A pair of fly wings can also be added to your creature to give it both the jump and fly ability. If you’re not interested in flying, there are other parts which will enable just jump on its own. Not much use in my opinion. You can unlock jump at the start by adding cilia to your new creature. Some parts and feet allow you to sprint, which increases your speed for a while. You can unlock this at the start by adding a jet to your new creature. A few parts allow an ability called sneak. Your creature turns partially invisable. You can unlock this at the start by giving your creature a flagellum. If you give your creature some arms, they can grab food out of the taller plants and throw rocks and sticks at higher fruit or other creatures (normally it just annoys them though). Also, depending on which path you took in cell stage (or if you even did it), you will unlock a unique skill. Herbivore: Siren Song is your super power. You can charm even your most hated enemies into liking you for a while. You can then socialise with them like normal, and even make them your allies! Omnivore: Your super power is Call Pack. A swarm of little flying creatures come to your aid. You can’t socialise with them, but they follow you around and help you kill or socialise with other creatures. Normally their only strenght is their numbers, but if you’re lucky the species might be fairly evolved (though they doesn’t use any of their other skills if you don’t already have them). Carnivore: You get Ranging Roar as your super power. If you’re completely outmatched in a fight and you need a quick getaway, you can perform an extremely loud roar which will send any nearby creatures fleeing. The aim of creature stage is to gain DNA points and evolve. To get DNA points yo umust befriend of kill other creatures. You can get bonus DNA points for doing things such as moving to a new nest, eating another creatures egg, or by killing or becoming allies with a rogue creature. Rogue creatures are rare creatures, who hunt alone. They are much stronger and bigger than other creatures, and are soemtimes incorrectly referred to as ‘mini-epics’. However, unlike true epics, they can be socialised with, and make very good allies. Epics are gigantic versions of another creature. They can normally kill anything in one hit (though rogues may endure multiple hits from an epic). They are of limited intelligence, not being capable of socialisation, and rely on roaring, stamping, swiping and picking up creatures, biting their heads off and throwing the carcass away in battle (which, in fairness, are some pretty decent moves when each is normally a fatal hit). If you manage to kill an epic in creature stage, you get the ‘Epic Killer’ achievement (if you have an online account). Killing epics is a dangerous business. As they are so big, you must stay far away from them in order not to get hit. If you want to get them stuck somewhere, you can either lead them under trees (which doesn’t always work) or lead them to your nest 9which is a better option, as your nest-mates will help kill it, and you can heal yourself there if you somehow manage to survive a hit. When you manage to lure one back to your nest, it will usually get stuck there (especially if it’s a more advanced nest with little walls around the corners) and you are free to hit at it. To be safe, you should only use the spit attack in case it manages to hit you. It’s usually too busy hitting at the other members of the nest, as they normally decide to get up close and personal and bite at their feet. If you’re lucky, they may get stuck in the epic’s feet, which lets the creature swipe all they want at the epic without it being able to do anything about it. Remember the epic isn’t your only priority. You still need to eat. if you’re a herbivore or omnivore, this won’t be a problem as there will probably be some fruit bushes around. If you’re a carnivore, it will be much harder. Luckily, when the epic dies, you’ll have food for months. Note that epic killing is quite pointless, as they never show up as extinct in your Sporepedia, and you don’t get any DNA points (which might be a good thing as you’re creature’s timeline would probably drop right down to Predator (which might be a pain if you want the other two). The only use you get off killing an epic is the achievement, tonnes of food, and perhaps some cool screenshots if you’re that way inclined. Stacks of orange rocks (as seen on a type of storybook planet). Gear-shaped rocks (again, can be seen on a type of storybook planet). A volcano. If you manage to get up to the top and have a pair of wings, you can get a massive flight boost. Red spice geysers. Always red. These give you a bit of a boost too if you have wings (if not, it’s still a pretty nice view… until you hit the ground). Tentacle rocks (from yet another storybook planet). Apart from creatures, there are also a few hazards you should watch out for. Volcanoes. If you’re stupid enough to jump over the top without wings, you’ll find out why pretty soon. Sea monsters. Even though it is technically a creature, it doesn’t show up in your Sporepedia and cannot even be fought. When you swim out to deep waters (even if you’re in a lake) a giant green monster will jump up out of the water and eat you whole. No way to avoid it. Meteor showers are annoying events. They usually only take place once during creature stage, but if you’re in the middle of a fight they’re a real nuisance. Not only do all the creatures run around screaming, not letting you fight them, but if you get hit on the head b ya meteorite you will get dazed for a while (as if someone used the charge attach on you). Aliens. They like to scare creatures, and abduct one or two sometimes. Irritating if you’re trying to socialise and the creature gets sucked out of the air. Aliens never abduct you or your companions. Also, if you’re lucky (or should I say unlucky) it will be a Grox ship. This way you can have a close look at their unique ship without having to fly to the centre of the galaxy. Anyway, once you get more DNA points you’re brain will get bigger and your stature grander. By the end of it, you’ll look pretty cool, and have a massive amount of health. When you’re ready to move on to tribal life, click the advance button. If you wanna stick around for some achievements or something, you’re free to do so. It’ll be fairly easy to do now, too, since you have so much health. Also, don’t forget to read Jamie’s Chrome Experiments post and woof’s comic if you haven’t already.